Nearly all the woodturner demonstrators I watched used scrapers at some point. Up until then I’d been told scrapers were for butchers who didn’t know how to turn, which is all and good if you turn all day everyday. But for most of the people I know, we are lucky to get in a few hours a week. So I was amazed to see professional turners use the scrapers so freely to blend and finish. They all seemed to use the 20/40 scrapers or negative rake, but different to the ones I’d seen before. The top edge is ground to 20 degrees and the bottom to 40 degrees like in this diagram. 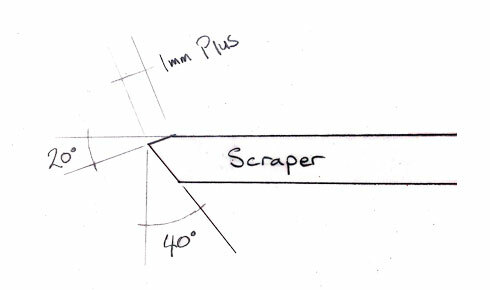 The top edge/plane can be anything in length from 1 mm – 10mm depending on the scraper’s thickness and shape, then grind your bottom edge at 40 degrees. The secret to sharpening is to only grind the 40 degree bottom edge, scraper facing upward, to create the burr that does the cutting. Do not touch or stone burr! If you want a larger burr have the top facing down. Try both ways and use the one you prefer but when turning, try to keep cutting/scraping edge on or near the centre line. So I reground an old crappy skew out of my junk box,and found that using it was a joy and really easy to use. Applying just minimal pressure the shavings whisks off so fine they just crumble on contact. I then ground an internal radius scraper with the same pleasing result, it blends and takes out turning lines with ease. I highly recommend you try this style. I don’t think there is a hard and fast rule for the 20/40. You may find changing the angles may work better for your application but 20/40 is a good starting point. We’d really like to know your comments and trials so we can all share the knowledge. Remember: Have fun & Happy Woodturning! ps next week I’ll post a snippet on concave skews.